Note: CFACT’s new skeptical documentary, Climate Hustle, is set to rock the UN climate summit with red carpet’world premiere in Paris. AUSTIN, Texas – A team of prominent scientists gathered in Texas today at a climate summit to declare that fears of man-made global warming were “irrational” and “based on nonsense” that “had nothing to do with science.” They warned that “we are being led down a false path” by the upcoming UN climate summit in Paris. 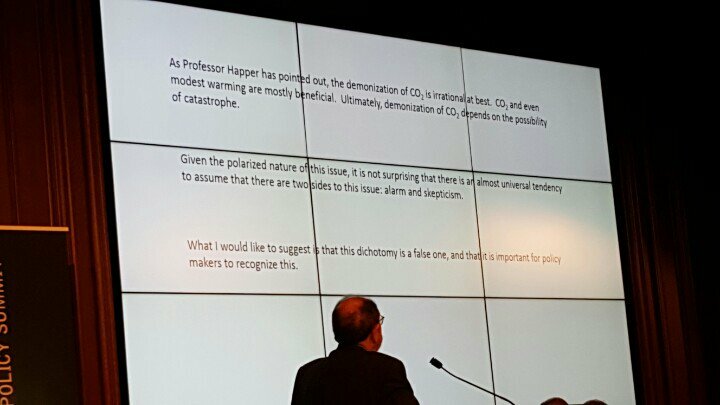 “Demonization of CO2 is irrational at best and even modest warming is mostly beneficial,” Lindzen said. Lindzen also challenged the oft-repeated UN IPCC claim that most of warming over past 50 years was due to mankind. “People get excited over this. Is this statement alarming? No,” Lindzen stated. “We are speaking of small changes 0.25 Celsius would be about 51% of the recent warming and that strongly suggests a low and inconsequential climate sensitivity – meaning no problem at all,” Lindzen explained. “I urge you when looking at a graph, check the scales! The uncertainty here is tenths of a degree,” he noted. “When someone points to this and says this is the warmest temperature on record. What are they talking about? It’s just nonsense. This is a very tiny change period. And they are arguing over hundredths of a degree when it is uncertain in tenths of a degree,” Lindzen said. “The UN IPCC wisely avoided making the claim that 51% of a small change in temperature constitutes a problem. They left this to the politicians and anyone who took the bait,” he said. “The discourse of catastrophe is a campaigning device,” Hulme wrote to the BBC in 2006. “The language of catastrophe is not the language of science. To state that climate change will be ‘catastrophic’ hides a cascade of value-laden assumptions which do not emerge from empirical or theoretical science,” Hulme wrote. “Is any amount of climate change catastrophic? Catastrophic for whom, for where, and by when? What index is being used to measure the catastrophe?” Hulme continued. Lindzen singled out Secretary of State John Kerry for his ‘ignorance’ on science. “John Kerry stands alone,” Lindzen said. “Kerry expresses his ignorance of what science is,” he added. Lindzen also criticized EPA Chief Gina McCarthy’s education: “I don’t want to be snobbish, but U Mass Boston is not a very good school,” he said to laughter. “Policies to slow CO2 emissions are really based on nonsense. They are all based on computer models that do not work. We are being led down a false path. “Our breath is not that different from a power plant,” he continued. “To call carbon dioxide a pollutant is really Orwellian. You are calling something a pollutant that we all produce. Where does that lead us eventually?” he asked. “Coal, formed from ancient CO2, is a benefit to the world. Coal is CO2 from ancient atmospheres. We are simply returning CO2 to the atmosphere from which it came when you burn coal. And it’s a good thing since it is at very low levels in the atmosphere. We are in a CO2 famine. It is very, very low,” Happer explained. Happer continued: “CO2 will be beneficial and crop yields will increase.” “More CO2 will be a very significant benefit to agriculture,” he added. “If you can see it, it’s not CO2,” Happer said. 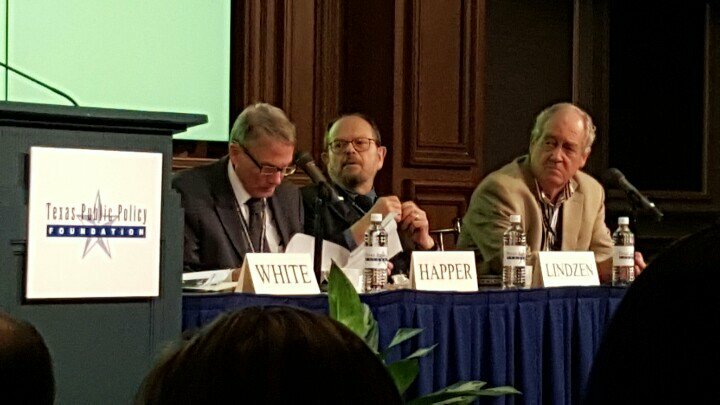 “If plants could vote, they would vote for coal,” Happer declared. Happer also rebutted the alleged 97% consensus. “97% of scientists have often been wrong on many things,” he said. Ecologist and Greenpeace founding member Dr. Patrick Moore discussed the benefits of rising carbon dioxide in the atmosphere. “Let’s celebrate CO2!” Moore declared. “We know for absolute certain that carbon dioxide is the stuff of life, the foundation for life on earth,” Moore said. “We are dealing with pure political propaganda that has nothing to do with science,” he continued. “The deserts are greening from rising CO2,” he added. 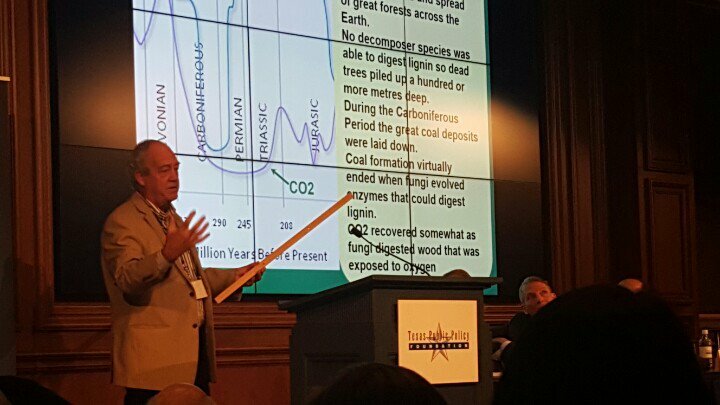 “Co2 has provided the basis of life for at least 3.5 billion years,” Moore said.